The trick to finding good breads and pastries in Venice is to make sure that the baked goods are baked on the premises rather than brought in from the mainland. One way to tell is, of course, by the smell of fresh bread wafting down the street. 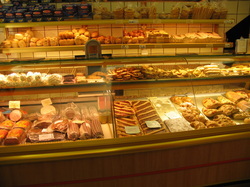 Another way is to look for the small signs that authentic bakeries display: “Produzione Propria” or “Nostra Produzione”. Both of those signs mean “our own production”. 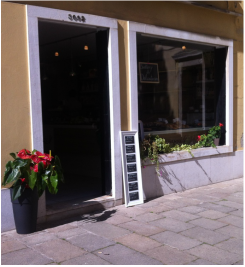 Bellow are a selection of excellent bakeries and pastry shops in Venice, most of which are family owned and operated. Panificio Barozzi, 3092 San Polo, Near Campo dei Frari. One of the best, and most diverse bakeries in all of Venice! Panificio Barozzi is a must for those who like savory breakfast pastries. They bake amazing black olive scones and feta spinach tarts. Nevertheless, they have a selection certain to please everyone. OG Venice is a fan of the variety of wholegrain breads that they bake throughout the week. Marchini Time, Campo San Luca, San Marco. 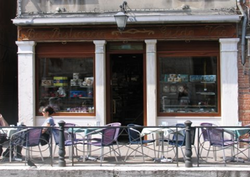 On the corner of Campo San Luca, in the San Marco district, Marchini Time is an excellent bar pasticceria frequented by everyone and a favorite of San Marco residents . Don't let the location fool you! This is a very central place that is absolutely worth visiting! And, no, they won't pick your pocket while you're here. 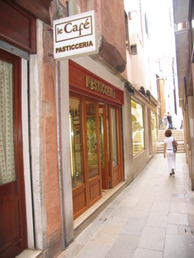 Prices are equal or less than other pastry shops in Venice, while the quality is absolutely equal to or greater! Pane Focacce Molin, Castello 3154 in Salizada San Francesco near San Francesco Della Vigna. This small bakery in Castello is absolutely one of the best in Venice. Every morning neighbors awake to smell of fresh baked brioche, pastries and breads, and many choose this shop over nearby bakeries because, at Molin, the ingredients are natural and organic. Their focus is definitely on quality over quantity with a small selection of breakfast pastries, loaves of bread and focaccia in the morning, and focaccia pizzas in the afternoon. The shelves become bare very quickly here! So make it your first stop for breakfast supplies in neighborhood! Bar Pasticceria di Chiusso Pierino, Castello 3306 on Salizada Dei Greci. Good things come in small packages; Great pastries in Venice come from this tiny bar/ pasticceria. In this neighborhood, neighbors argue over which kind of pastry to buy here, never whether to buy them somewhere else. All made in-house, including the croutons served with evening cocktails at the bar, you'll find a small array of freshly prepared baked goods here that changes depending on the time of day you arrive. There will be assorted brioche in the morning, pizzete in the afternoon, and pastries all day long. Panificio e Pasticceria Crosara, Giudecca 655, near Palanca. Panificio Crosara is an authentic Italian bakery on the island of La Giudecca located between the Palanca vaporetto stop and the Hilton Stucky. There's nothing fusion, modern or pretentious here, just dedication to the art of baking fresh delicious breads and pastries. Theirs is still the best olive bread I have ever tasted and the first time I tried it was ten years ago. Pasticceria Rizzardini, 1415 San Polo in Campiello dei Meloni, near Campo San Polo. The owners here serve only delicious fresh-baked pastries, they do so with a constant remembrance of the history of this place and the craft of baking in Venice. This spot has been a pasticceria (or "scaleter") since 1741. Many traditional recipes are still baked here. Colussi Il Fornaio, In the San Marco district on Calle San Luca Near Campo San Luca. On a narrow street, just a hair's breath away from the busiest pedestrian part of Venice, a tiny slice of paradise! Colussi is a wonderful bakery that serves up not only the usual breads and biscotti, but also muffins, savory tarts and lots of other baked treats that are usually to find in Venezia. Paneficio Volpe Giovanni, 1143 Cannaregio, On Ghetto Vecchia. Paneficio Volpe Giovanni is a kosher bakery to rival any Manhattan Kosher bakery on both quality and demand. Whenever I've visited, this bakery has been quite busy and it's easy to tell why. Everything here is just absolutely delicious. 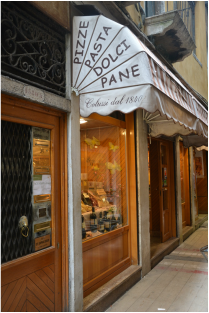 The fragrance of fresh baked breads from this shop wafts across the Cannaregio district. If you have trouble finding it, follow your nose to the fresh rosemary flatbread. Pasticeria Gilda, 784 Santa Croce, On Fondamenta Rio Marin. The Pasticceria Gilda offers one of the most idyllic locations in which to enjoy a coffee and pastry in Venice. Though only five minutes away from both Ferrovia and Paizzale Roma, the shop is small and quaint with only a few outdoor tables along a quiet canal. Add to this a friendly waitstaff and very good pastries and you've got a near perfect place to relax in and take in the beauty of Venice away from the crowds. Pasticceria Rosa Salva, Campo San Giovanni e Paolo, Castello. Simply sublime pastries in an equally gorgeous environment. Whether you choose to eat at the bar and run - in Italian style - or relax at the tables outdoors, you will not be disappointed with the quality of the pastries and snacks at Rosa Salva. Le Cafe, In Campo San Stefano, San Marco District, Near the Accademia Bridge. Le Cafe, despite serving very heavy tourist traffic, remains one of the best pastry shops in Venice. Here you can enjoy a desert with an excellent glass of wine (or coffee, tea,or hot chocolate) in the large outdoor seating area on Campo San Stefano. Or save some time and money by running down to Fuori Menu, their take-away shop to grab some goodies to go.